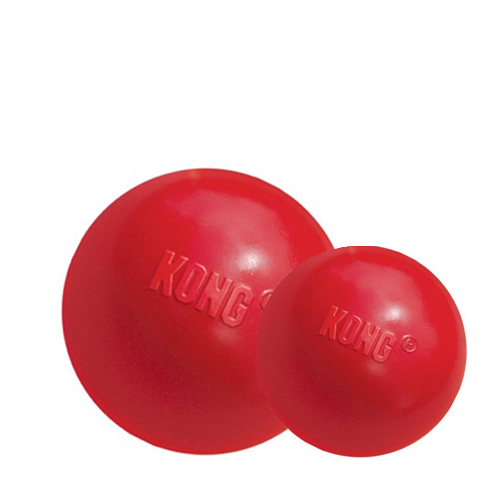 The KONG Ball is the perfect toy for enthusiastic dogs that love to chew and play fetch. The toy ball is made from durable rubber and virtually undestroyable. Playing with your dog is not only fun, it is also very beneficial for the owner-dog bond and is a good way of exercising. It is also a good way of teaching your dog commands such as 'down', 'leave it' and 'stay' in a playful way. You and your dog can have hours of play and fetch fun! The ball is made from durable rubber, which makes the toy virtually undestroyable and suitable for enthusiastic chewers. For strong chewers we recommend KONG Extreme Ball. Small: Suitable for dogs up to 16 kg. Medium/Large: Suitable for dogs of over 15 kg. Have you used KONG Ball before? Let us know what you think about this product.